Another star follower for Pandiya Naadu! Director Suseenthiran's Pandiya Naadu seems to be just notching up its star followers count every passing day! Many celebrities have been appreciating this movie, starring Vishal and Lakshmi Menon. 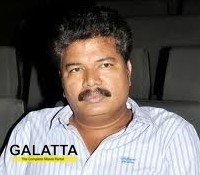 The latest is none other than ace director Shankar! Ever since he joined Twitter, Shankar has been interacting regularly with his followers! After expressing his appreciation for Ajith's Arrambam, Shankar posted a tweet on Pandiya Naadu! His tweet read, "Today saw Pandiya Naadu .. scenes, emotions and heroism work well. Enjoyed watching .. Suseenthiran's realistic telling is very good". This is sure to be a major boost to the already heady Pandiya Naadu team. Vishal, who made his debut as a producer through this movie is also very happy! >>Vishal and Hari to join hands! >>Lakshmi Menon is hot property! >>Vishal - Pandiya Naadu was most challenging! >>Pandiya Naadu - More screens in AP than TN! >>Vasuki Bhaskar designs again for Bharathiraja! >>Sandakozhi 2 - Alaalaa Video Song Is Out!